So here’s the deal: i haven’t been doing any brawl hacking for… well, a while now. more importantly, its looking like i’m not going to be continuing any work for a long time (Halo Reach’s Forge 2.0 has me distracted). Because of this, i’m afraid that i won’t be able to finish my Dreamland 64 in a timely fashion. That said, i’m going to give you guys what i have now: Dreamland 64 (Beta). This stage loads normally over FD, but will work on GGs with the included rel. Keep i mind, this stage is NOT the finished version, for textures or layouts. Its currently set up to accommodate P:M physics, so when playing in brawl it will probably feel off. another thing to note is that wispy will not blow wind. 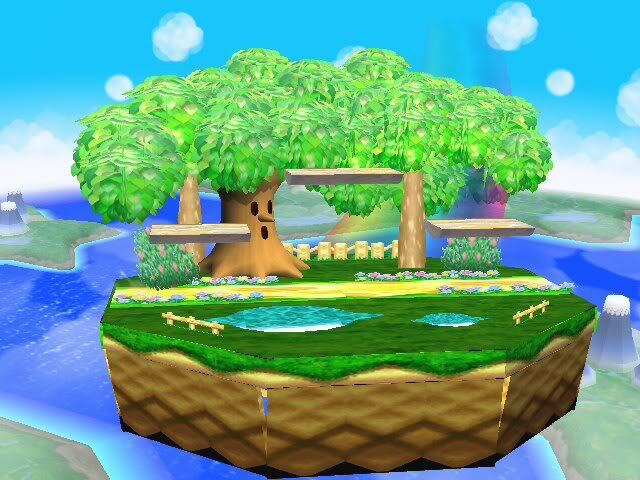 hopefully i’ll be able to fix this when i come back to brawl stage hacking, but for now its just not available. Anyway, this will hopefully tide you over until i can come back and finish up my work on this long overdue stage. (keep in mind i’ll still be doing other texture hacks, just not as much with stages as they’re very time consuming). Please enjoy.